My husband and I are in the process of revamping our kitchen and living room, which is an open concept space. Throughout my house we have lovely (not really) popcorn ceiling. I realized recently that I haven't had a smooth ceiling since I got married. That's a little upsetting to me. 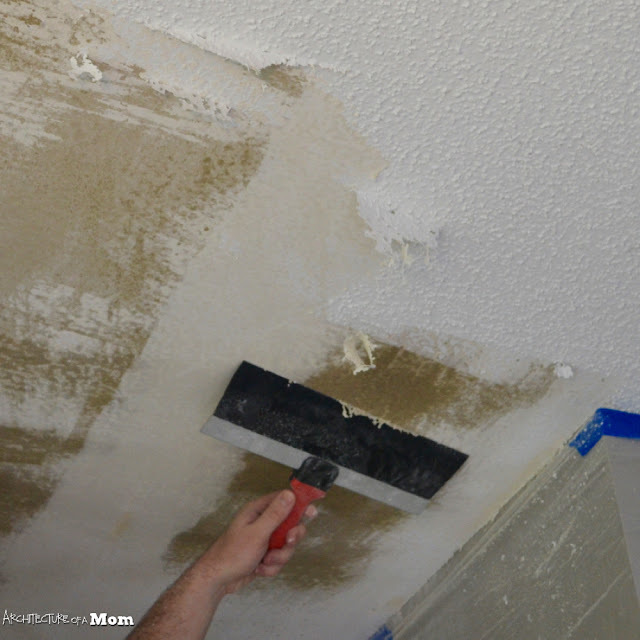 Remember how last week I told you 7 reasons that you need to remove your popcorn ceiling? I've had a long time to think on those. Well, this week, I'm going to tell you how to remove your popcorn ceiling in 4 easy steps! Yes, really. 4 easy steps. Taping knives/putty knives: 1 recommend have 3-4 sizes: 10-12" wide knives for large swathes and the 1-3" wide ones for small areas around lights and in corners. Water sprayer. This post is sponsored by HomeRight (but all opinions & popcorn ceilings are mine), so we were provided the Homeright Deck Pro 2 gallon sprayer to review, but I have to say that we were impressed. 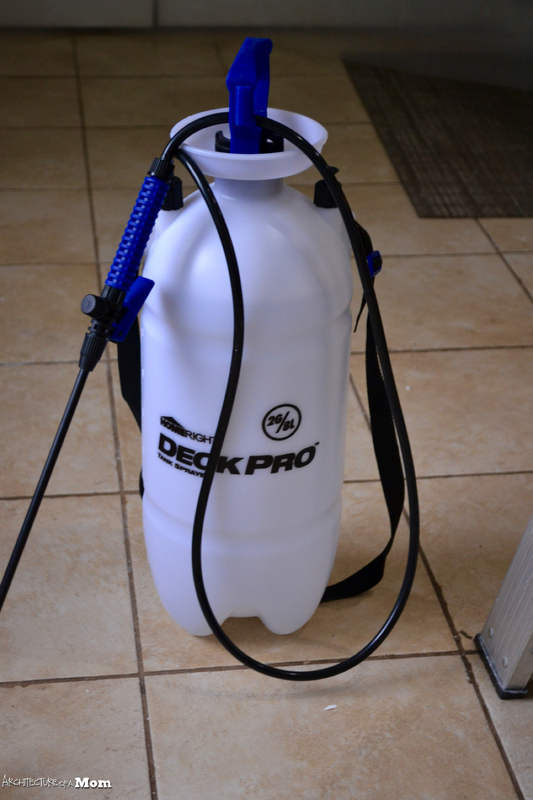 The mechanics of this tool are simple: fill the tank, close it up, pump it up by hand, and spray! We only had to refill once (it has a 2 gallon capacity). It has a carrying strap which made it easy to carry around the room. It has 2 nozzles: a cone nozzle and a flat nozzle. We used a flat nozzle because it has a wide spray pattern – perfect for covering wide areas of awful ceiling popcorn! Protective gear – do not skip this. Please use a breathing mask and safety goggles. I don't care how good you think you are, this stuff rains down everywhere. It'll feel like you transferred all the popcorn onto you when you're done. I also recommend a kerchief for your head - it makes it easier to get clean if you have more than a crew cut. Optional: a shop vac. We purchased this after we saw the big mess that we made despite having plastic. There will be gaps in the plastic that you don't catch, or you will accidentally track popcorn everywhere in your house. I don't care how good your regular vacuum is, it's not made for this stuff. Don't risk it. 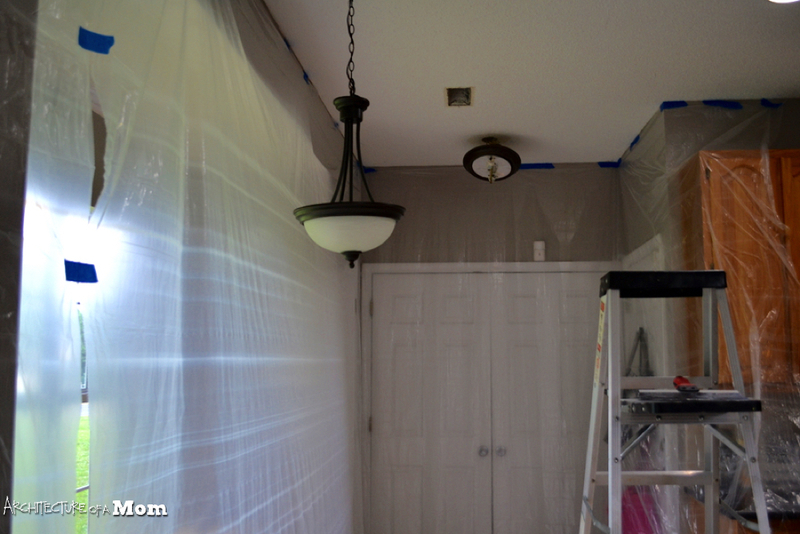 Tape up the plastic drop cloths at the top of all walls. Cover all floors, counters, surfaces, and furniture that is remaining in the room. This is the least rewarding portion of the process, but do it. Remove any fixtures you have attached to the ceiling. Pen up any children or pets you might have. They don't need to breathe (or worse, eat) the popcorn that will be flying. Using your tank sprayer, wet down about a 4'x4' to 4'x8' section of the ceiling. Let sit for about a minute, then spray again over the same area. Place the putty knife up against the ceiling. You want the blade to be as level as possible and as parallel as possible to the ceiling. This will minimize damage to the wallboard that is behind the popcorn. Scrape. Be amazed at how most of the popcorn comes off in a sheet. Repeat steps 3 and 4. I recommend having one person down on the ground doing step 3 (spraying the water ) and having another person up on the ladder doing step 4 (scraping). It saves a lot of going up and down the ladder. The HomeRight Deck Pro has plenty of power that I was able to hold the nozzle above my head while standing on the floor and get a good spray on my ceiling. I'm 5'-5" and my ceilings are 9'-0". There are a couple of things to note. 1: I told you these steps are easy. They are. However, they are not quick. 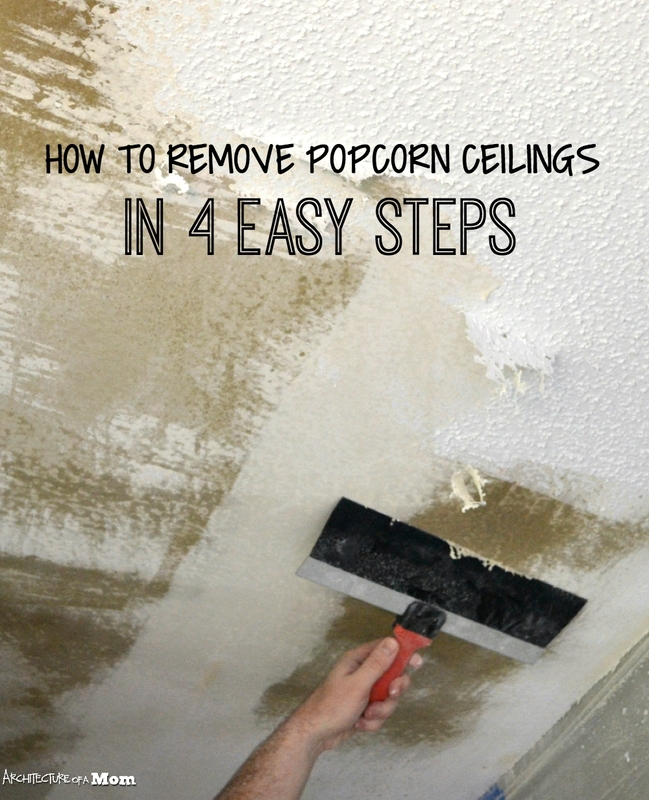 2: at the end of this 4 step project, you will have popcorn-free ceilings. However, you will not have beautifully painted and smooth ceilings. But you can do a 350-400 square foot area in about 4-5 hours with 2 people. 3. You still need to clean up, but it will be relatively easy with the plastic drop cloths and a shop vac. If some popcorn got on your walls because you were less than diligent in your taping, you can use the Homeright Deck Pro to wet the area and then wipe off with a clean rag. Then all you have to do is patch any uneven spots (that all depends on the drywall guy that built your house) and paint. That's it! Who wants to join me in scraping all the ceilings? Come on! I love to party! 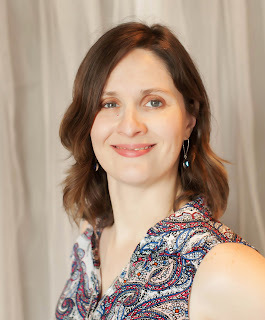 Sometimes I link up my posts to Serenity Now, Organizing Junkie, Remodelaholic, Tidy Mom and these link parties! 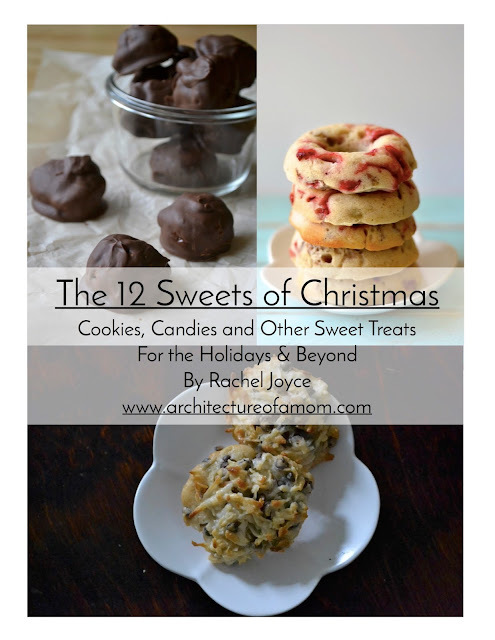 You should come party with me and check out some awesome new bloggers!